This UK-based HiFi Company has earned a well-deserved reputation worldwide both because of the quality of its loudspeakers and for the large number of models which offers to the audiophile crowd. 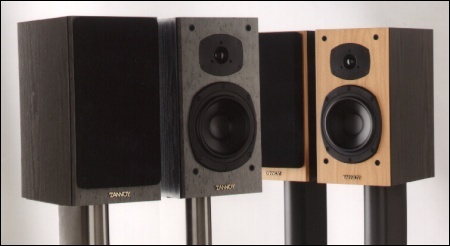 Tannoy loudspeakers can easily satisfy everyone's needs, ranging from the expen$ive and esoteric ones to the budget-conscious models. These Mercury M2's belong to this second category, being one of the cheapest models made by Tannoy: 350 $ (your mileage may vary from Country to Country) for a pair of medium sized two way bass-reflex loudspeakers is a pretty low amount of money. More precisely, for 350 bucks you get: a 16.5 cm woofer and a 1" dome tweeter, a mid-sized cabinet (20 x 38 x 27 cm) available both in black vinyl and cherry wood (vinyl, actually, no real wood finishes at this price), no biwiring and a pretty nice finish level for the price. The cabinet is on the light side and the knock-test produces a pretty resonantb thud. Apart from this detail, that unveil the real price of the Mercury's, they appear less cheap than they actually are, a very appealing feature for absolute beginners. I am much more interested in the sound, of course, so I'll try to tell you something about the sonic personality of these British loudspeakers. they have been installed into various HiFi systems, both of the same price range and even very expensive ones. In particular the Mercury's have been matched to a Marantz CD player (the CD 38) and a Marantz PM 57 integrated amplifier, since the Italian distributor had proposed this combo at an extremely low price. Then I've included the Mercury's into a budget HiFi system (Rotel, Teac) and into a very expensive one (Linn, Sonus Faber, Opera) where the intereconnects cost four time the price for a pair of Mercury's. The Mercury M2 has certainly been designed to satisfy a large number of audiophiles: for this reason a particular attention has been paid to the frequency response, well extended at both ends. While it is quite easy for any decent tweeter to reproduce reasonably well the highest frequencies it becomes a difficult task for a cheap woofer into a mid-sized enclosure to sound decently powerful and deep. Nevertheless, the Tannoy designers seem to have been able to recycle their experience on more expensive projects, since the Mercury M2 has a quite deep and powerful bass range, surprisingly articulated for the price. It certainly contributes to the big sized sound of this loudspeaker: a must for every entry-level design. A slight tendency to bass boom from the resonant cabinet limits the performance of the bass range: with a stiffer cabinet I'd have rated it excellent for the price. It is just very good, indeed. The mid range is natural, just a little bit *behind* the bass and the highs, but still very enjoyable, even when reproducing difficult female voices. A good level of introspection and analysis completes a performance in the mids that can be considered surprisingly correct for the price. Then add an open, crystal clear high range and you get an idea of the sound of the Mercury M2. Just let me point out that the tweeter doesn't seem perfectly linear, in the sense that it seems to have a peak in its frequency response that makes the sound quite bright, nothing that can't be cured by means of a careful speakers placement into the listening room (see the paragraph some advice below for details). Apart from this peak of the tweeter (most cheap tweeters are far from being linear, and even many expensive ones...) the Mercury M2 tonal balance is surprisingly good for the price, with a very good bass frequency response. Cheap speakers can't play miracles, y'll know this (or, at least, you SHOULD know this). The Mercury is no exception to this rule. Nevertheless its sound is quite vivid and plenty of life, just a bit compressed in the bass. No, I'm not saying this loudspeaker isn't punchy: it is, indeed, provided the musical program isn't too complex. As expected, the macro-dynamics performance of the mid-high range is better, though I won't suggest to drive this speaker far too loud or it'll start to shout and the sound will easily become edgy and aggressive. Let me clarify this a bit further: in my opinion this loudspeaker plays at its best into mid-sized rooms (20-22 m2) while into larger rooms it seems to have some trouble, as into small rooms (less than 14/15 m2) too. For smaller listening rooms I'd suggest the Mercury M1 model while for larger ones I'd suggest the M3. Please have in mind that it is the loudspeaker that should be choosen depending on the room and NOT viceversa. You should know this: when, for a given price, you get something very good (the depth of the bass range) there's always a trade off. In this case it is the slowness of the bass, nothing particularly relevant, especially considering the price, but still quite noticeable (one of the first things you hear when you compare the M2 to smaller, similarly priced loudspeakers, such as the Wharfedale Diamonds, for example). Obviously enough, if you have a fast bass range, you lose the depth. Do you want both? Be prepared to open your wallet wider (way wider!). Anyway, I like the pace the Mercury M2 gives to the Music. Is there any other budget loudspeaker that does better? Yes, of course, but then you should say NO to a deep bass range or to something else. There's nothing like a free meal, keep this in mind when choosing your next loudspeakers. Fisrt of all let me say two words about the correct placement of this loudspeaker into your listening room. Choose a pair of heavy stands and secure the M2 to them using blue-tack or even bolts. The loudspeaker is light but quite large so it is very prone to oscillate and vibrate. In my opinion, some blue-tack is the way to go for easier placement. Also, a little amopunt of toe-in is required to tame the peak of the tweeter and to get a deeper soundstage. A felt (demi)ring may help on this, too. Then a few words about partnership. The Mercury M2 should deliver 88 dB @ 1 Watt...but my experience suggests a more realistic 85 dB. When compared with well-known 88 dB loudspeakers the M2 sounds lower and, to get the same amount of acoustic pressure, you should turn the volume knob clockwise more than usual. This happened with 3 different amplifiers into 3 different HiFi systems and listening rooms and, considering that one of this amplifiers can made sound loud everything I've ever tried to connect to it, I'd conclude that the M2 needs AT LEAST a 50 watts good amplifier UNLESS your listening room is very small. There's no need to spend a lot of money, any budget audiophile-oriented integrated amp will get the job done. Finally I've noticed that the M2 likes to sound very often, in the sense that if you leave your HiFi system off for a few days you may need some break-in before getting back to the usual performance. This is normal for EVERY loudspeaker, but the M2 seems to like to play Music everyday. Uh, well, just a bad guy could complain of a pair of loudspeakers that for this few dollars offer so much Good Music. And I'm bad. Well, not really. I'd only have preferred a sturdier cabinet just to improve the already good quality of the bass. And let me add a tiny amount of extra sensitivity, too. After all, it seems that the designers at Tannoy have released an improved version of the M2, named M2.5 with, guess what, a stiffer cabinet, a new crossover and a double magnet equipped woofer. Of course, it costs more than the M2 (there's nothing as a free meal, remember?). The Tannoy Mercury M2 gives you a huge amount of Good Music for a tiny amount of money: a must for any serious audiophile-wannabee on a budget.